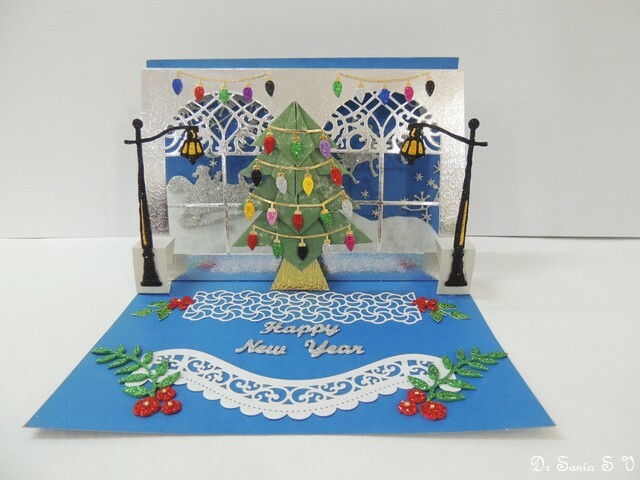 Pop Up Card for a little girl ! 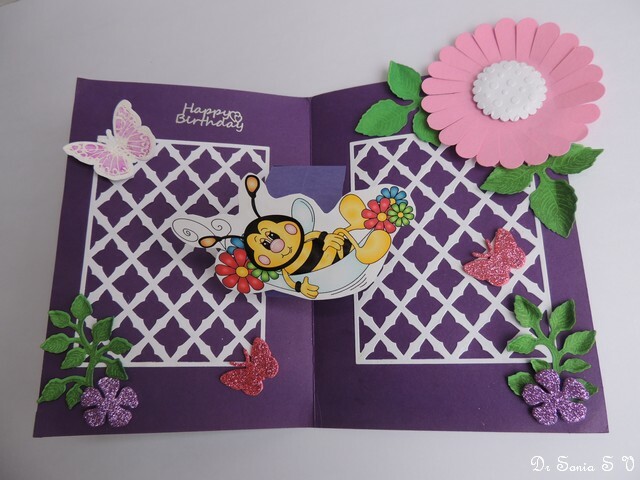 On opening the card another cute little bee swings up [a digital image from Digital Delights also seen in Swinging Card tutorial ]in her hammock amongst glittery butterflies and sparkling flowers in my favorite lattice background [from Poppy stamps]. 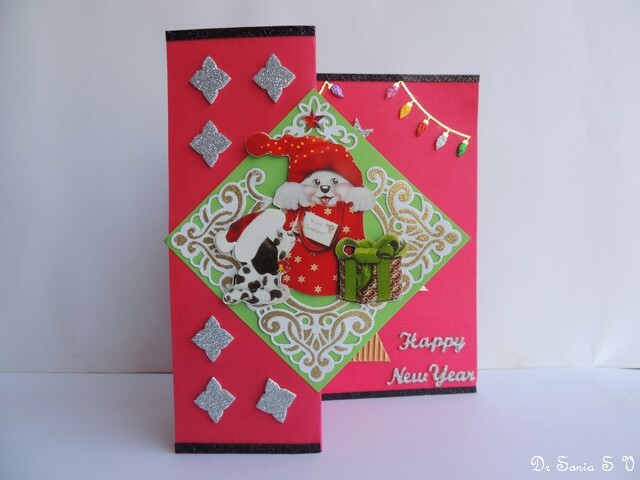 I kept the card relatively simple without pearls and tiny embellishments as it was for a 2 year old! 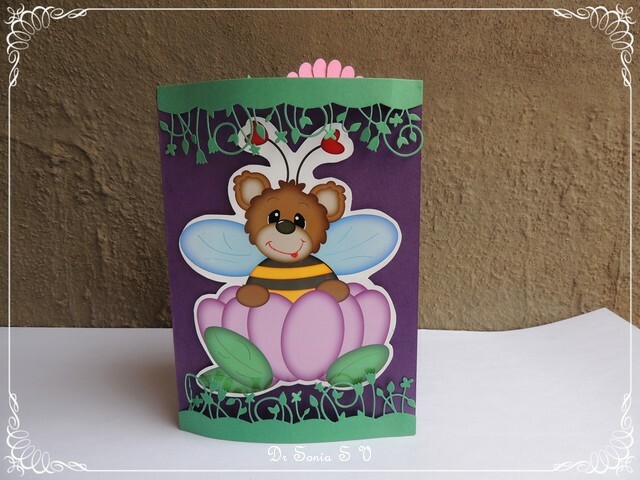 Children love pop up cards and it was fun to see the wonder in my little niece's face when we gifted her the card! 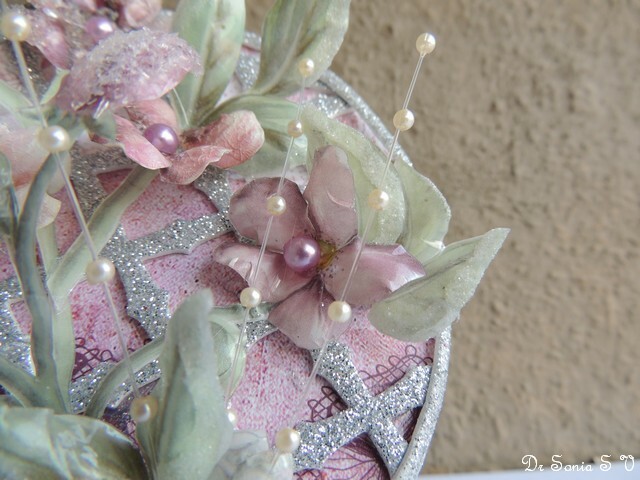 I hope you liked it too! 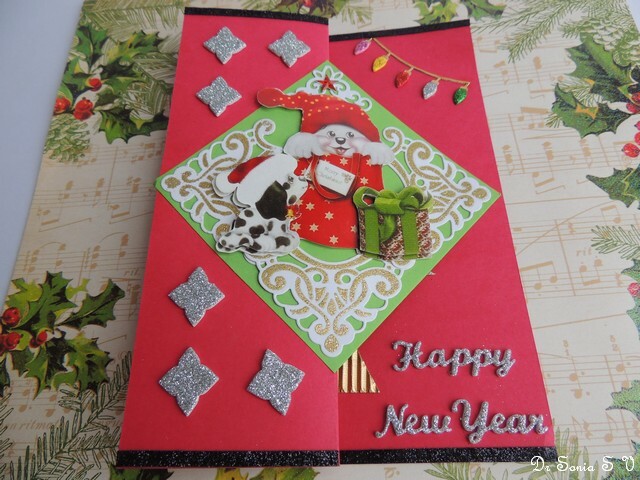 Hi friends as the year end approaches I seem to be engulfed in a whirl wind of activities juggling family commitments and the professional front! 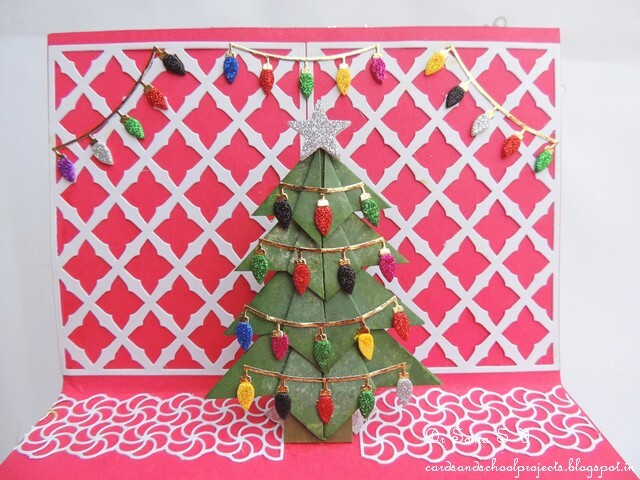 Writing blog posts seems to calm me down and I am so thankful for all the loving comments you leave on my blog though I have been so erratic in returning blog visits! 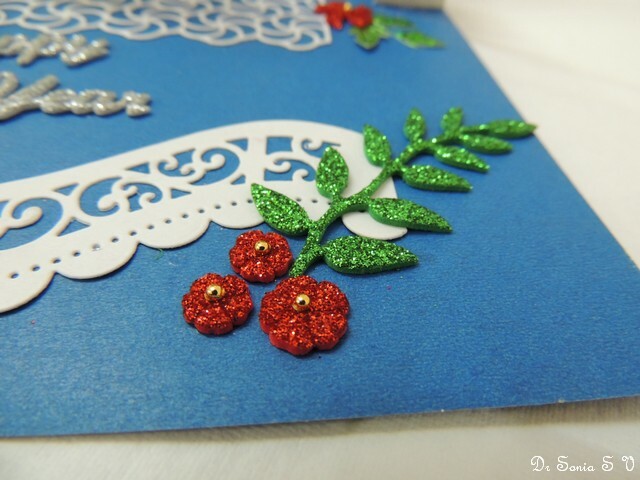 Actually this is a super simple tutorial for beginner card makers so my experienced friends please do bear with me! 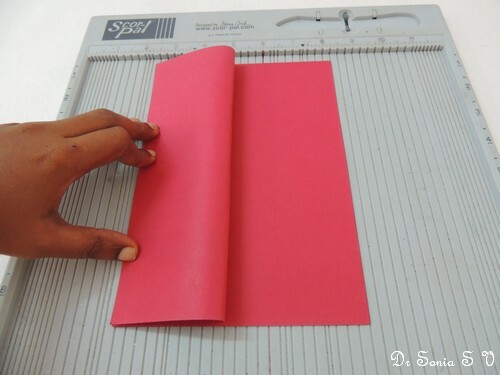 Fold it in half and crease the fold line well with a bone folder/ blunt knife or your fingernails! 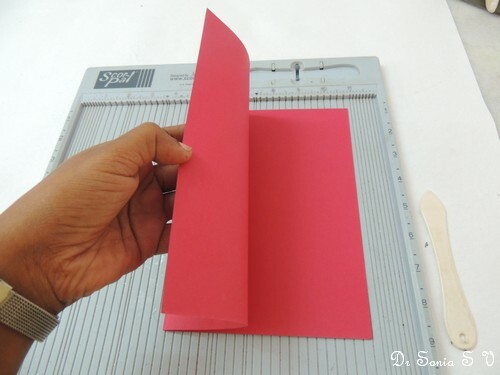 Take the front half of the card and fold it towards the left as shown to reach your original fold line. 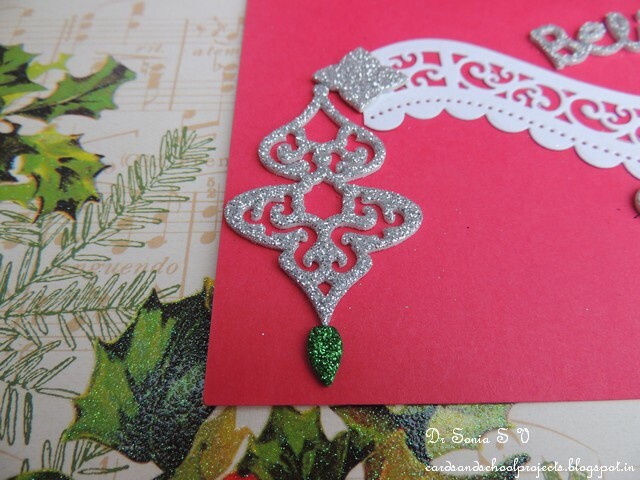 You don't have to measure - that's the best part of this card design! 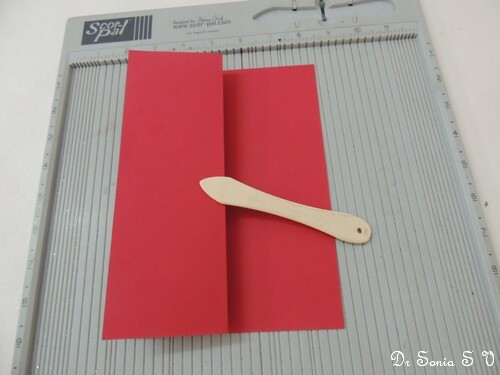 Crease the fold well with the bone folder / blunt knife/ finger nails! 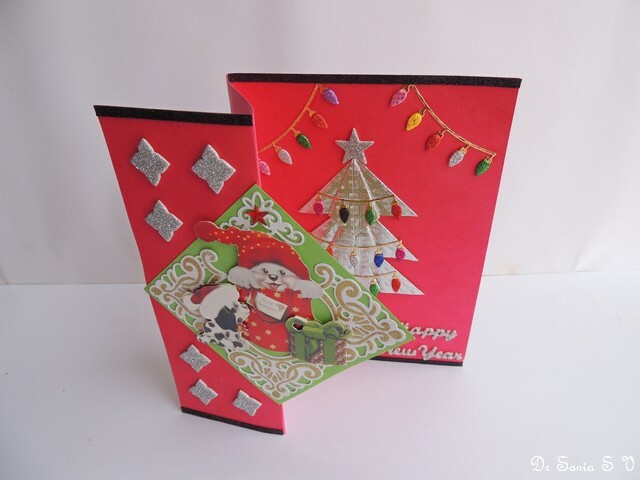 You have a self standing " Z fold" card ready to decorate. 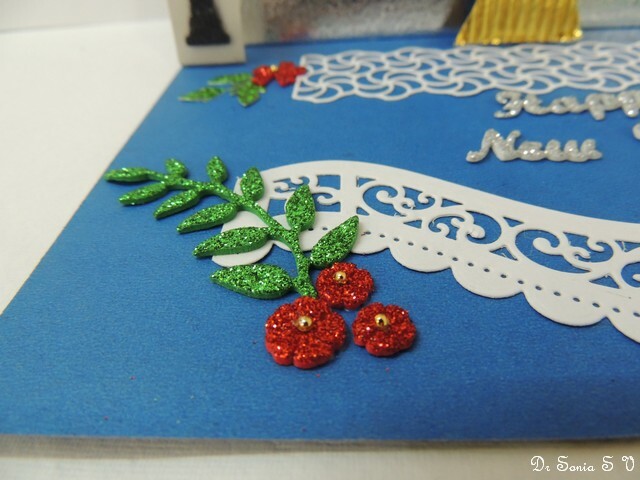 The lacy mat below the Christmas tree is a Poppy Stamps die cut and the New Year is a Memory box die .Love how glitter foam can give so much dimension and sparkle to any project! 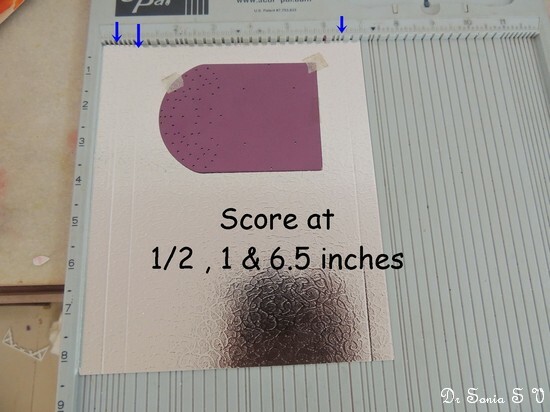 Scored an 8 x 7 inch card on the 7 inch side at 0.5 , 1 and 6.5 inches to give gluing tabs of 0.5 inches on each side.Later on mountain fold at each score line. 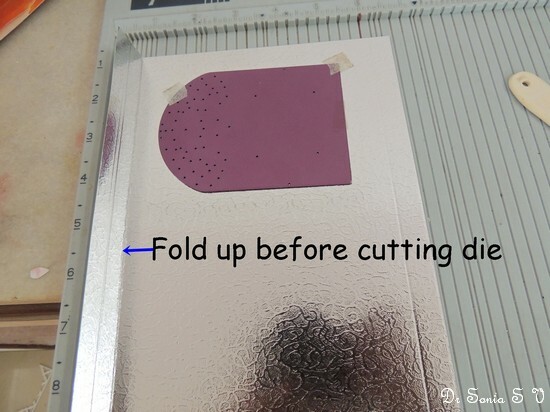 Since I use a Big Shot whose comfortable card cutting width is 6 inches, I folded up the score line on one side as shown so that my card can easily pass through the Big Shot to cut the Cheery Lynn window die. 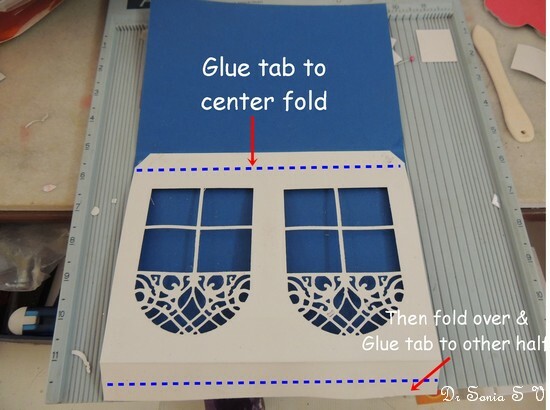 After cutting out one window I cut out another widow. 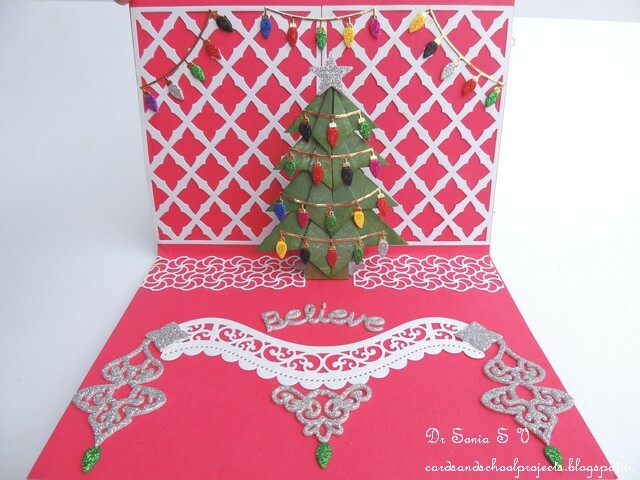 Use a low tacky tape to stick the die to the card so that it doesn't move around when you pass it through your die cutting machine. 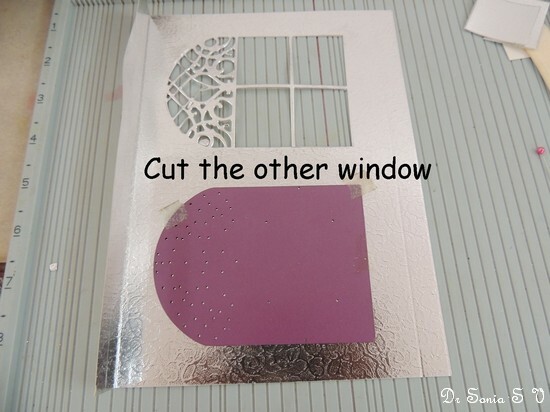 Another tip : To effortlessly cut the Cheery Lynn window die use the Cheery Lynn metal plate adapter. 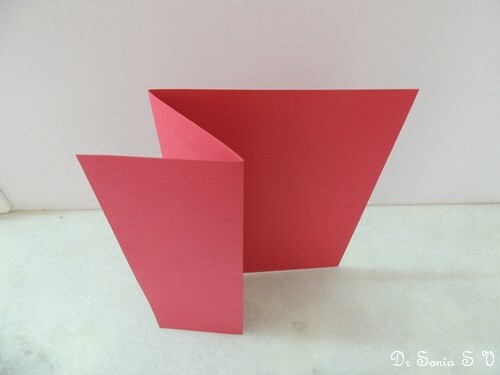 I used a folded A 4 card for the base of my pop up card.Glued the 0.5 inch tab to the center fold to fit the fold snugly. 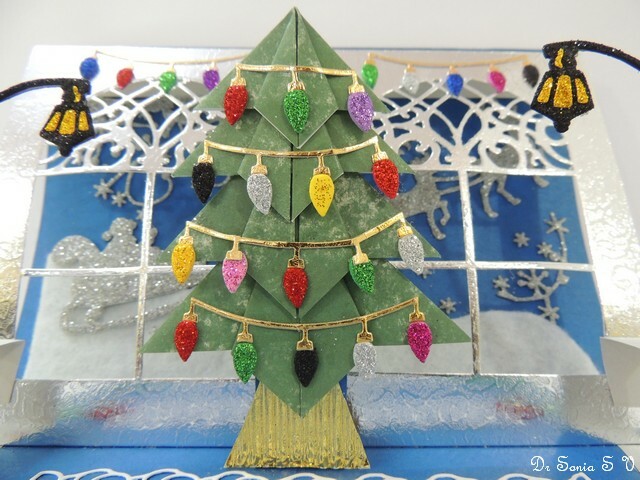 Added simple box type pop up mechanism to the window layer to add a 2nd pop up layer of lamp posts and an origami tree. 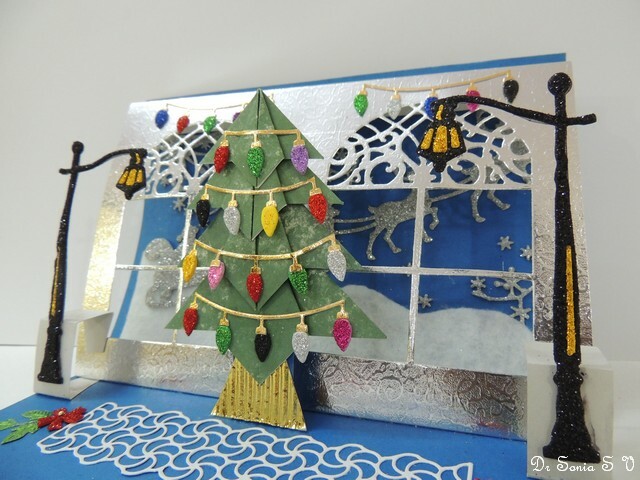 I die cut the Cheery Lynn Colonial lamp post in golden and black glitter foam to make mirror lamp posts. 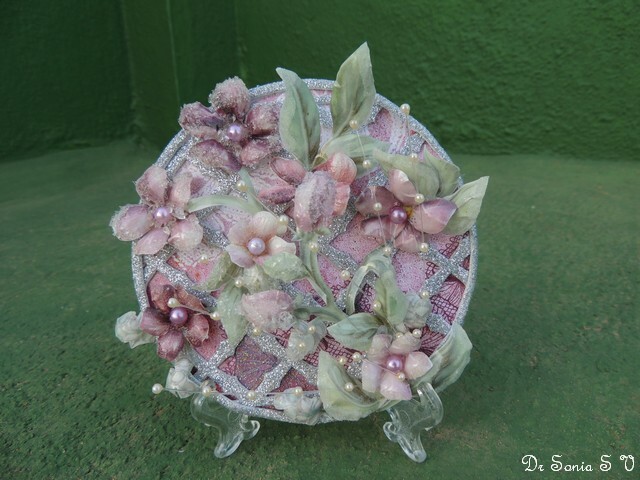 Hi friends of late I have been in a "non- paper crafting" mood .My fascination with the Italian craft of Sospeso Trasparente continues.To display the beautiful Sospeso Trasparente flowers I recycled a CD. 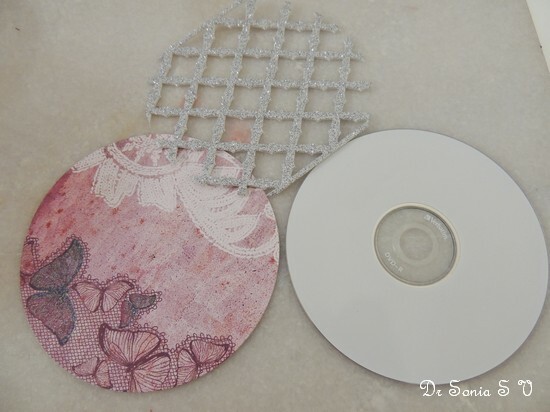 The picture above shows the CD, pattern paper cut out to fit it and glitter foam cut to fit the CD with my favorite Poppy Stamps Meso background die. 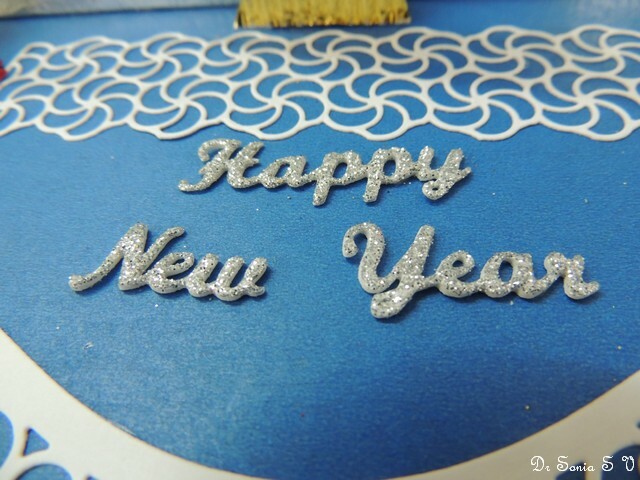 Glued the pattern paper to the CD and used PVA glue[ Fevicol Mr ] to stick the glitter foam die cut to the paper. 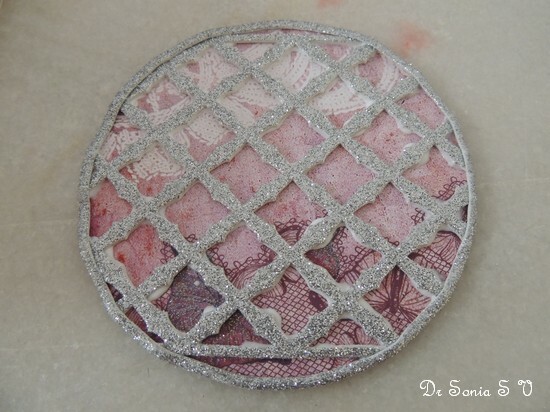 I used circle dies to cut a circular framework to fit snugly around the Meso background lattice. 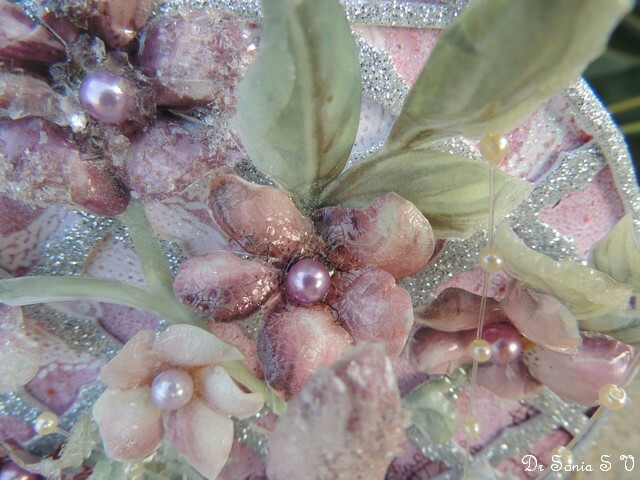 How are Sospeso Trasparente flowers made? 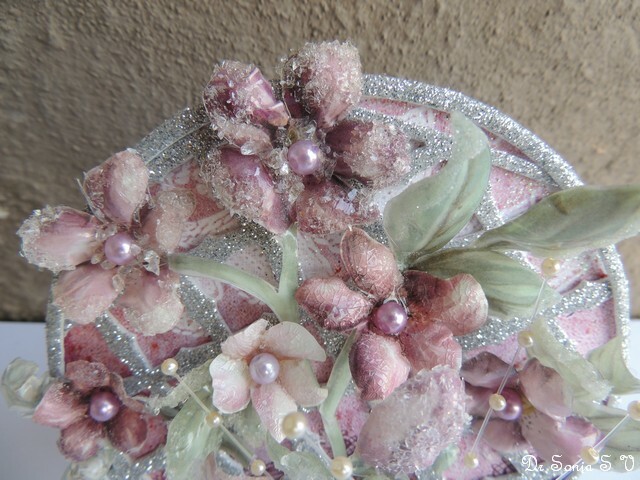 I had already introduced you to Sospeso Trasparente in 2 previous posts [ Sospeso Trasparente bouquet tutorial and Ice crystal flowers]. 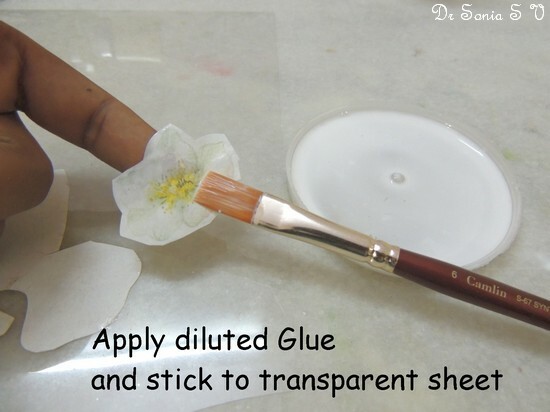 Roughly cut out the flower / leaf designs from the "Paper veils"
Apply diluted Sospeso Trasparente glue to the cut outs and stick to the plastic films. 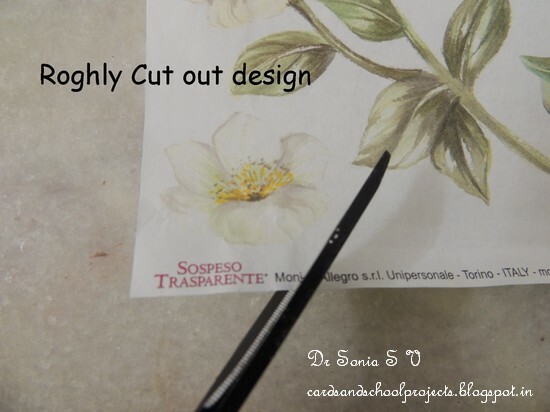 You can stick design side up or down depending on whether you want a paper or plastic look for your final Sospeso Trasparente flowers. 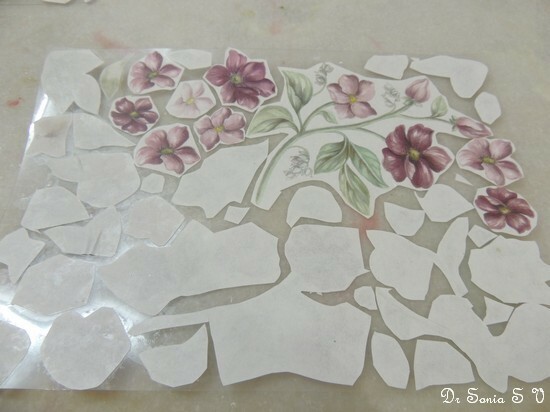 Allow the designs to dry, then cut out the designs and cut inwards towards the flower centers so that you can shape them later. 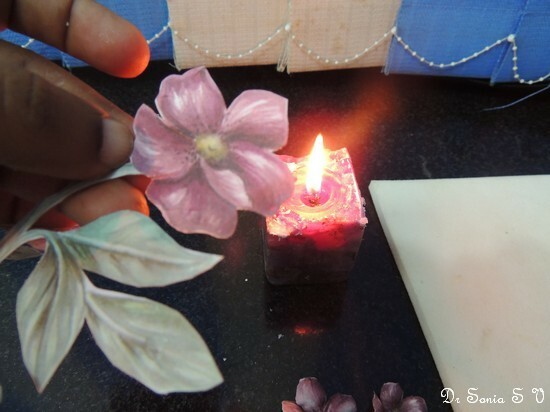 Hold the plastic side towards a candle flame and heat and emboss.Emboss the petals of the flowers from the under surface and emboss the center as shown below. 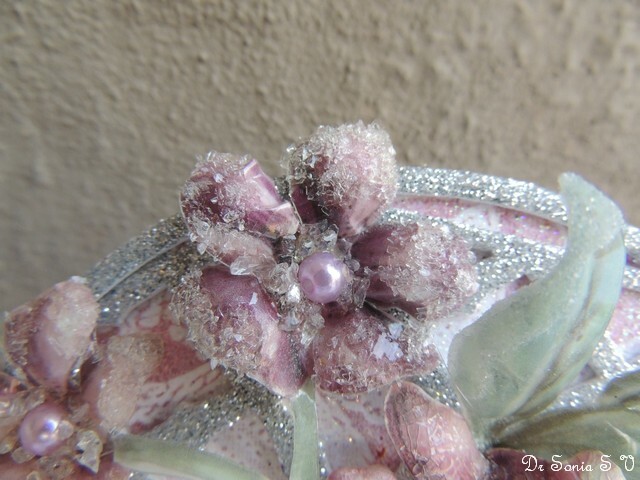 The flower above have a crackled glossy look because it was painted with Clear Rock Candy crackle paint. 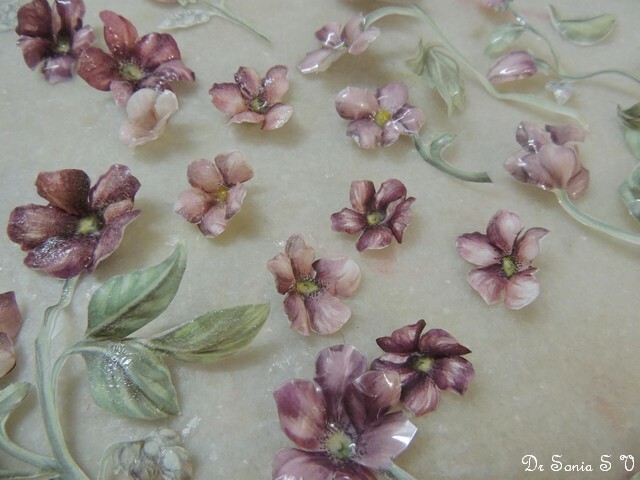 Dusted some of the Sospeso Trasparente leaves and flowers with distress glitter for a subtle shimmer effect.And some of the flowers like the one shown below were left plain and gorgeous ! 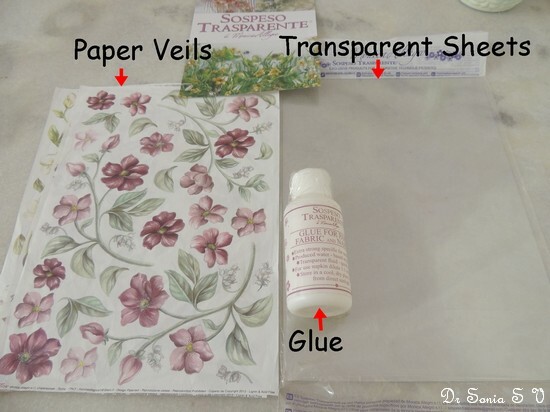 Many crafters asked me about best gluing options for Sospeso Trasparente as they found their work falling off projects! 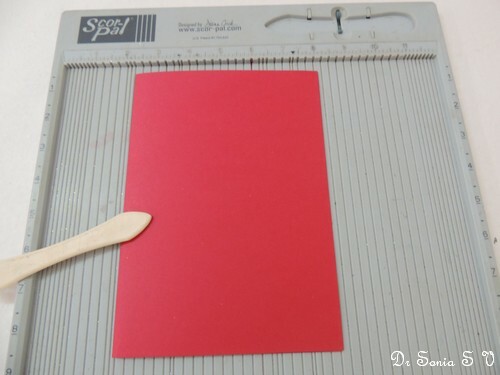 Sospeso Trasparente has plastic and as you all know plastic is not the easiest medium to glue! 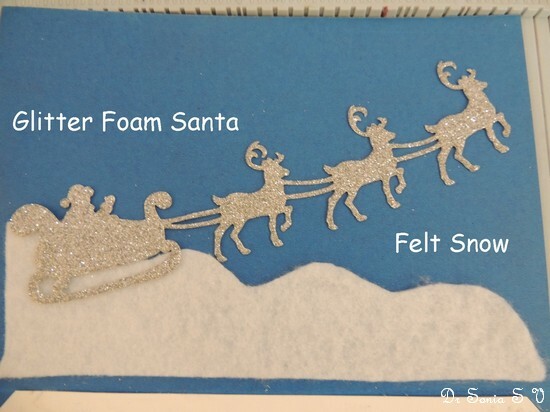 Another option is to stick to foam! 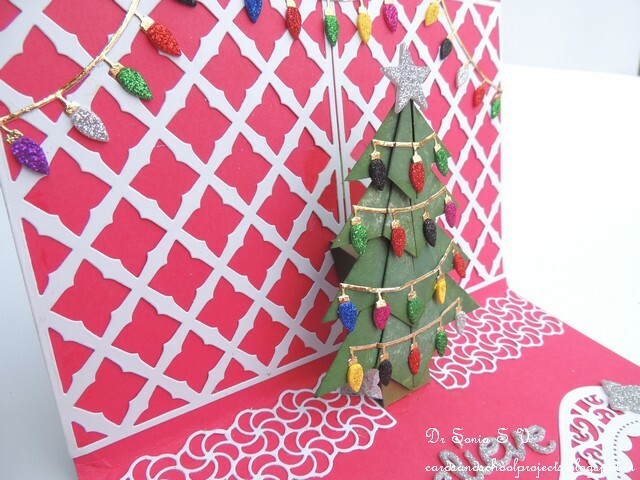 Foam and plastic literally melt into each other with hot glue form the simple glue gun and so you know the reason why I made my lattice background in foam! 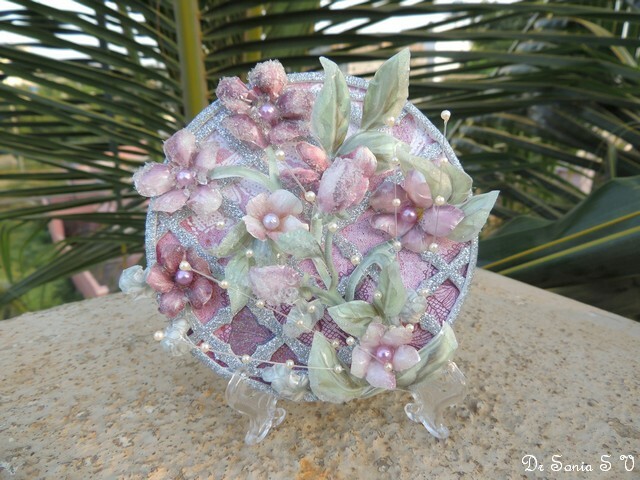 I hope you like my altered CD craft. 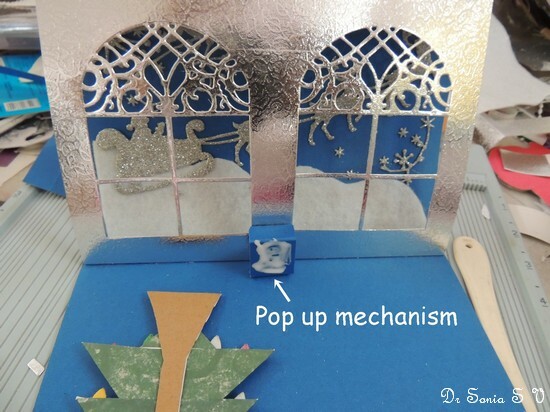 Hi friends I have a huge fascination for Pop up cards and can spend hours designing several pop up mechanisms in a pop up card but this one is super simple and has just one pop up mechanism which makes the Christmas Tree pop out on opening the card. 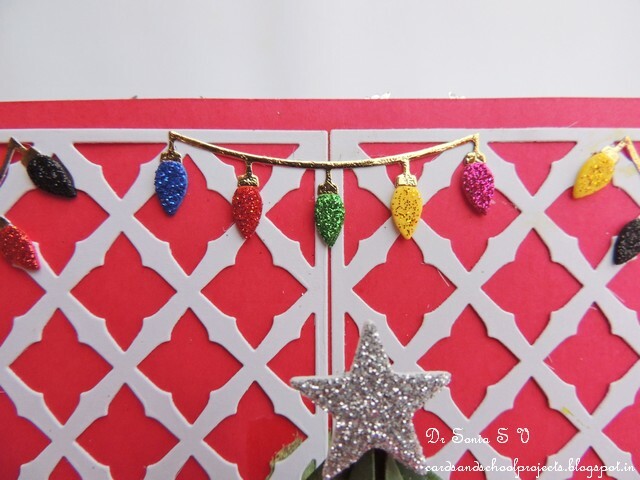 I used the Poppy stamps meso background die to make the backdrop to my Pop up tree and added Cheery Lynn Christmas light swag [bought with my win at Cheery Lynn Challenges] on the tree and on the lattice framework.It was so much fun making all the little light bulbs from different colors of glitter foam! Ha Ha almost felt like a child!! 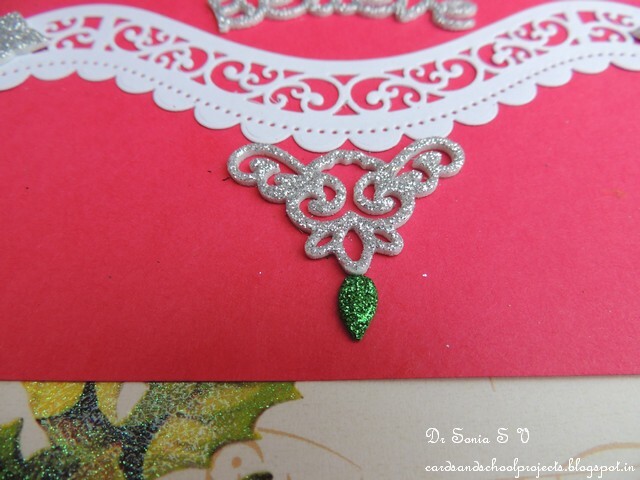 I used the negative of the Poppy stamps meso background die to form a diamond shaped anchor for the hanging ornaments at the base of the card.I have mixed and matched many brands of dies in this card and I guess its quite evident I love die cutting!! 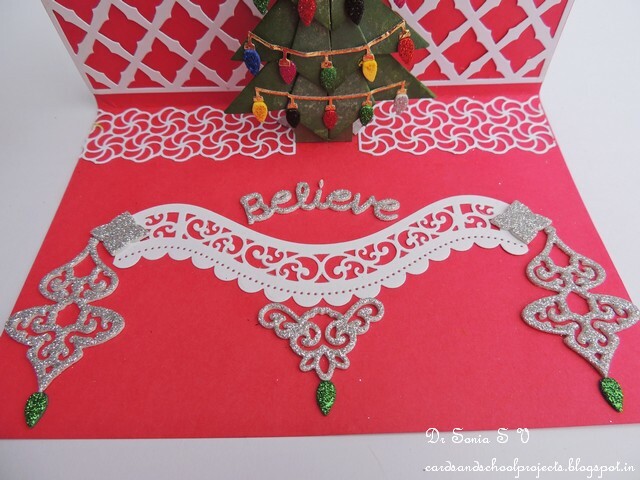 Here is the poppy stamps meso background negative "damond shape" with a Spellbinders ornament combined with a Cheery Lynn Christmas Light bulb! 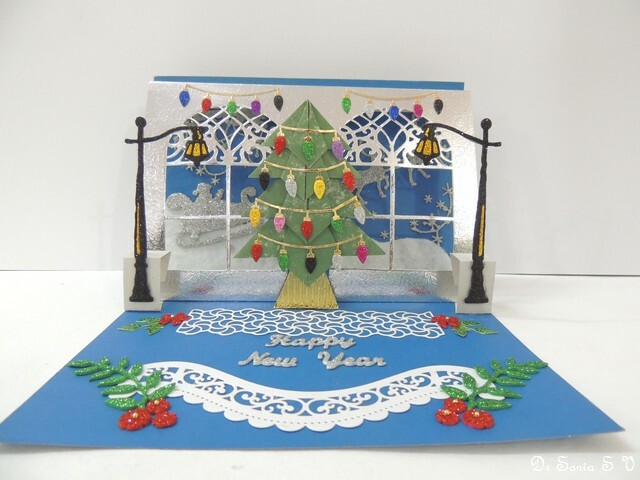 Another Spellbinders die [from the Spellbinders Lace heart set] + the cute Cheery Lynn light bulb! 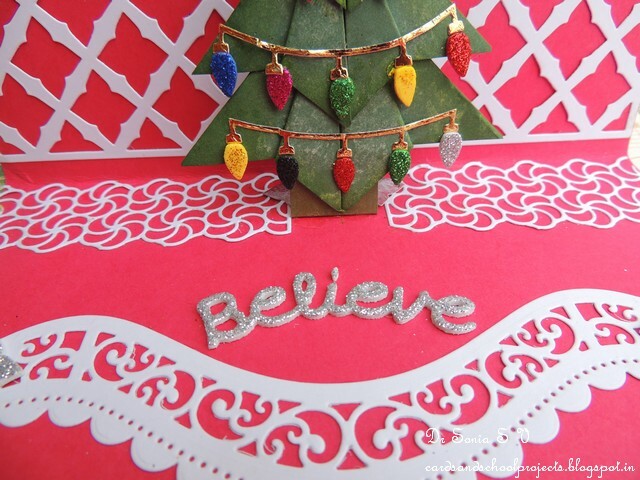 The "Believe" was also cut in glitter foam. 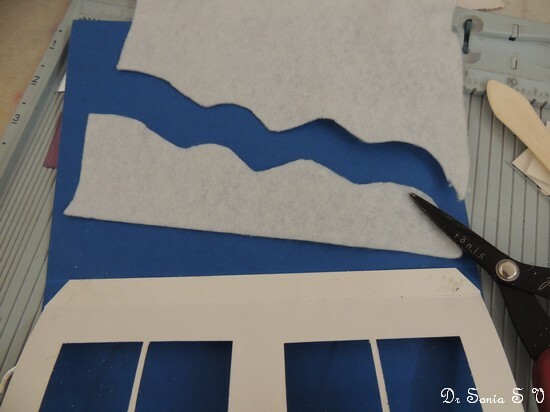 I love the dimension foam instantly gives a project! 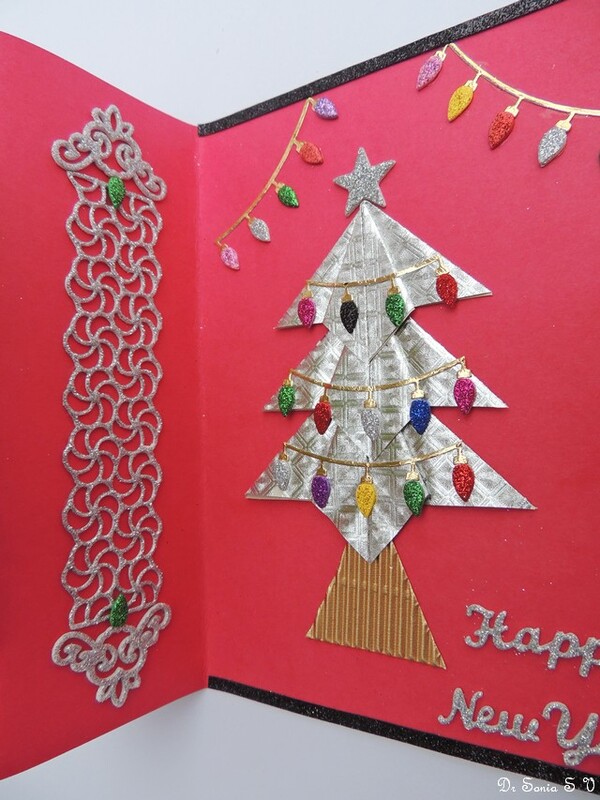 I hope you enjoyed this utterly glittery sparkly Pop up Christmas card. 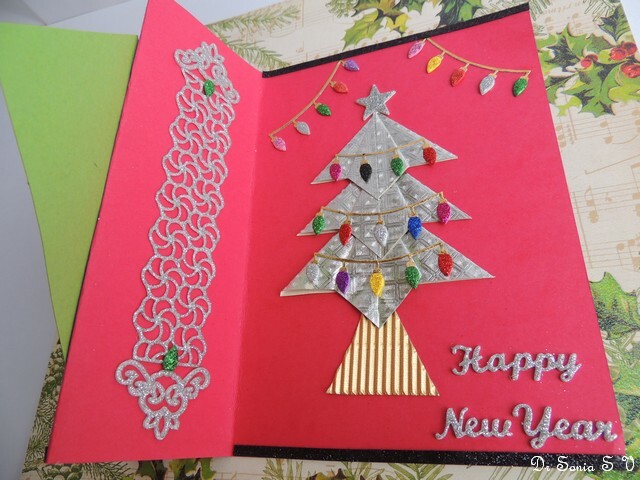 We gifted this card to my daughter's favorite Maths teacher! Do tell me how it has come out. 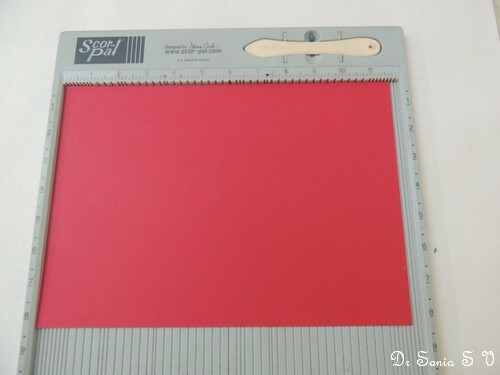 How I repaired my Big Shot !